Hello everyone! Today is a My Pink Stamper Post Day--yay! 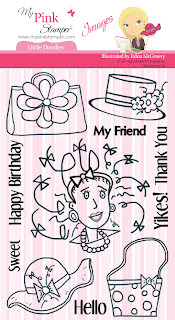 Today we are showing you one of her newest image sets Girlie Doodles along with one of the newest sentiment sets, Girlie Sayings. These go so well together!! Today, I decided to decorate a small gable box. I am loving the new image stamps from My Pink Stamper--they are so much fun to use!! Make sure to visit My Pink Stamper to see all the Design Team's fabulous projects and to see where you can order all of Robyn's wonderful stamps! Hello everyone! I think you can always tell when I have created for a new release when I actually post for several days in a row--LOL! It's always nice to have some creations ready to blog! 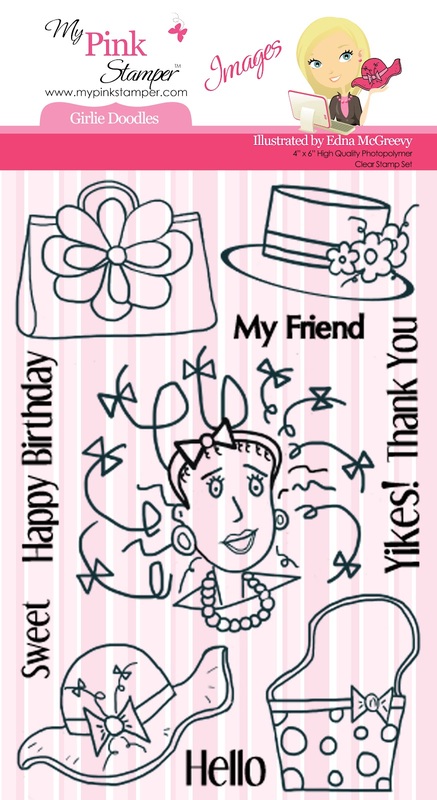 Today I have a sample I made for the new My Pink Stamper Girly Doodles stamp set. I am loving the rounded corners on my cards lately, as I'm sure you can tell! The second picture shows the Glossy Accents better, even though the color is worse. The confetti on the green is also a stamp in the kit. I cut out the present after it was stamped and cut and pop dotted it on. The For You!, was just written in. Hi everyone! 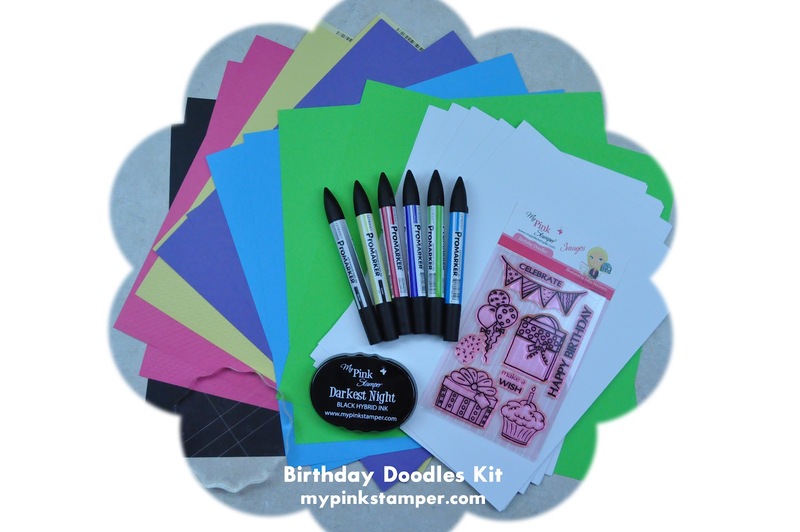 Today I thought I would give you the details of one of my cards that's over on My Pink Stamper today for the new Birthday Doodles kit. I have had so much fun playing with these stamps! I hope you ordered your kit this weekend since they are sold out. But you can still order them, it just will take a bit longer for you to get it. You do not need to add too much to this fabulous kit! I always need to add ribbon or twine to things and of course, stickles!! Have a great day!! I will give you details on more cards as the week goes on :) Maybe I will try another video soon on coloring in too. What a cute card! Thanks for sharing! Happy Birthday Emma! Be sure to check back tomorrow at 10:15am CST (11:15am EST) for the My Pink Stamper special release hop--so much fun!!! Here's a card I made yesterday when my husband and I should have been at lunch. But we were waiting for the air conditioner guy to do the annual checkup. Of course he was late and then other things had to be done. I think we are trying to get out for lunch today though! 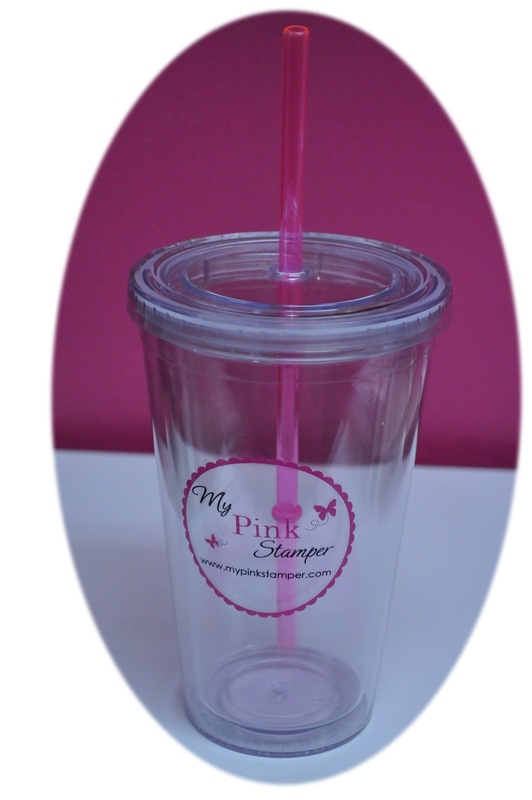 Now, don't forget that there is a very special My Pink Stamper release this Friday, the 18th. We will be having a blog hop at 10am CST (11am EST) and then Robyn will be having a My Pink Stamper Live at 11:30am CST (12:30pm EST). I will be at work during the Live show, but hope to take lunch at that time :) You do not want to miss it!! This blog hop is in celebration of Emma's birthday with just a little twist from the regular birthday blog hop. 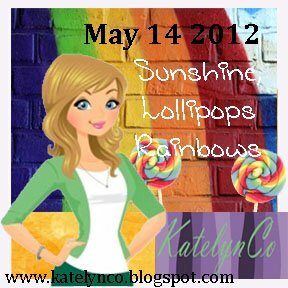 Emma was inspired by the song Sunshine, Lollipops and Rainbows written by Lesley Gore. I was going to make a 3D item, but it just wasn't working out for me and I've run out of time :) So I have a cute little sunshine rainbow card for you. Now that you've reached the end, I do have a giveaway for you. For leaving one comment today, you have the chance to win a DCWV 8x8 Scrapbook Kit in a Stack and some yummy ribbon. I will be drawing a winner on Wednesday so you can leave comments through Tuesday night. Thank you so much for stopping by and celebrating Emma's birthday with us! Your next stop on the hop is Jessica at Homespun Elegance. Here is the line-up for the Hop in case you get lost along the way. Hello everyone! I hope you have a fabulous Mother's Day!! I'm not sure how mine is going to turn out--we're about to head out to church and no one has said a thing to me yet :) Oh wait, I just got a hug from my daughter--Aww! Here are cards I made very quickly last night. I made 3 -- 2 blue and 1 pink. I used the Mother's Day cartridge and cut it at 3 1/2 inches. Then I put Frosted Lace stickles on it. Added paper from DCWV and organdy ribbon and there you go! The pink is my favorite :) Have a fabulous day everyone!! Hello everyone! Here's another scrapbook page I made over the weekend. I only got 3 done since I wasn't feeling the best. I really do hope to do one or 2 a week and make a little progress. I wish I had used some letters for the title, but it's all done and I didn't want to loose the fun twine buttons I had made! Happy National Scrapbook Day! I hope you are enjoying all the activities today and participating too :) If you have just arrived from the amazing Shelley, you are on the right track. If not, make sure to start at My Pink Stamper so you don't miss a thing!! Just a quick, easy page! I haven't been feeling the best this week and just ran out of energy for a more involved project. But I really hope you all enjoy! Robyn is very graciously letting us all give away a stamp set today! Thanks Robyn!! So I encourage you to create today!! Just leave a comment telling me what you are creating today or tomorrow and you will have a chance to win your own set of That's Punny-licous like I used today. This will be open until Monday night and I will draw a winner on Tuesday. 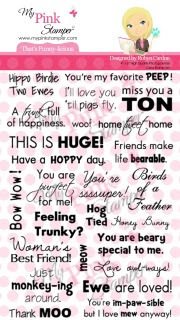 Now hop on over to the fabulous Edna (Create With Expression) to see what she came up with for you today :) Here's the entire hop list in case you get lost along the way. This was another quick and easy card. The silver paper was sticky backed. Someone gave it to me two years ago but since I am a hoarder, um saver, I still have most of it! And it was perfect for this project :) It cut very well on my E2. Have a fabulous day! And be sure to check in on Saturday for our My Pink Stamper National Scrapbook Day blog hop. I think I am actually going to make scrapbook pages all day--how about you?